Last week I was in San Francisco for some business meetings. On the weekend, after returning my rental car at the airport, I had to make my way to the Ferry Building to catch a ferry to Sausalito. 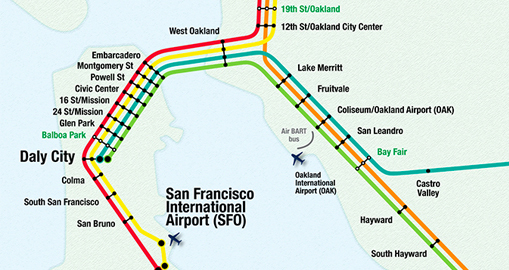 After returning my rental car, I hopped on the AirTrain and made my way to the BART (Bay Area Rapid Transit) station. As soon as I stepped off the AirTrain there was a huge line of people in front of the ticket machines and one unlucky woman whose job it was to help people with the machines. Unfortunately, I didn’t take a photo. But, to set the scene there were about 3 or 4 machines and a line of about 3 people deep for each machine. Since this was at the airport, most people had luggage, strollers, children, and all kinds of other things that took up space. Also, did I mention this was on one of the coldest days San Francisco has had in years. Apparently it was colder in San Francisco than back home in NYC!! Living in New York for seven years, I’m pretty comfortable with public transportation and can refill my NYC metrocard almost with my eyes closed. 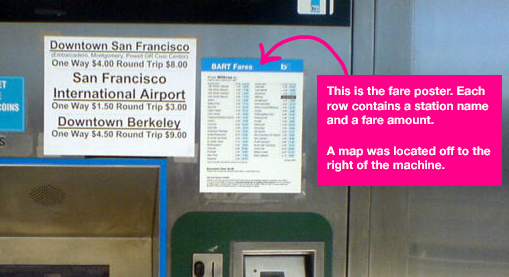 Unfortunately, I discovered that the process of purchasing a ticket with BART is much more complicated. I could tell purchasing a ticket was tricky because the ticket agent helping people was really busy and was just pushing the buttons on the machine for people – it was faster for her to just do it than to show people how to do it. I must have looked self sufficient because when it was my turn she went off to another machine! 1. Determine what zone you are traveling to. 2. Identify the price of the trip based on that zone. 3. On ticket machine, add the correct monetary amount to the ticket value. It seems like four easy steps, but the whole process is broken from my outsider experience. 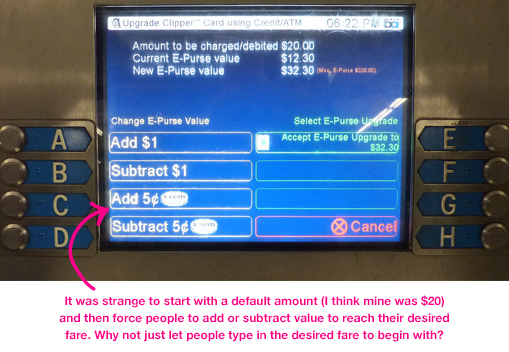 Here’s a breakdown of why I think the experience of the BART ticket vending machine could use an upgrade. First, you have to refer to a map or a list of stations that are shown on a poster that’s stuck to the vending machine. The problem is that when you first walk up to the screen and touch it, it is not apparent that you have to use a map or poster away from the screen. My mistake was thinking that I’d enter in a station name or landmark on the machine and it would figure out the zone and my cost. The price of travel to a zone is shown on the poster I mentioned previously. The problem is that the font size on this poster is tiny and there are a lot of stations listed. So for older people or people who don’t speak English, it could be challenging to find that station and price. This is where it got pretty tricky. I heard the ticket agent woman show the people in front of me how they almost purchased a $20 ticket each rather than the $8 ticket each that they needed. I approached the machine and quickly saw how someone could make this mistake. 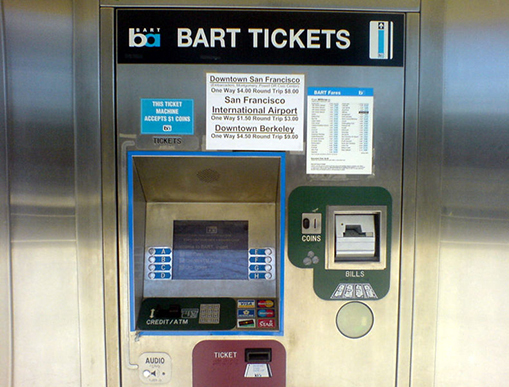 First, you have to insert a credit or debit card, or an existing BART card. Next, you are taken to a screen where it displays what seems like a default ticket value, I believe this was $20. This is where people get confused. You either have to add or subtract value from the card depending on your destination. To do this, there are a series of buttons on the machine that let you add or remove various amounts of currency, for example I think there was an option to remove $1 or $0.50 (among other combinations). This just seems very complicated to me. I don’t understand why I couldn’t just type in the value of the ticket I wanted to purchase. If my ticket was $8.25 I wish I didn’t have to remove value from $20 until I reached $8.25. For people who are not good at math, this could be very problematic. Math skills aside, it’s a friction filled process. Ok this was simple enough, but only after I got through the process of ensuring the value of the ticket I was purchasing was correct. All in all, I made it to the Ferry Building. But, the point is that this is a great example of an every day experience that could probably use some improvement from a user experience perspective. This is why it’s important to always keep your mind curious and aware of what’s happening around you. These machines are something that tens of thousands, possibly millions, of people use every day. It’s a shame that it’s not an easier user experience! What’s something you use in your everyday life that you think could use some UX attention? Tell me about it in the comments below.